I'd love to take the Wee Lass to Hamburg to see this fun thing. Interesting photo series of four sisters (as adults) over the course of 36 years. 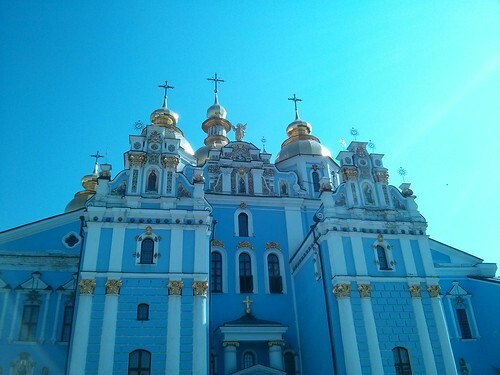 (via Making it Lovely). How "computer geeks" replaced "computer girls". Scientific proof that I'm not just an old lady for disliking noise. Interesting interviews with American expat parents around the world. Math, doodling, and stream of consciousness ponderings. 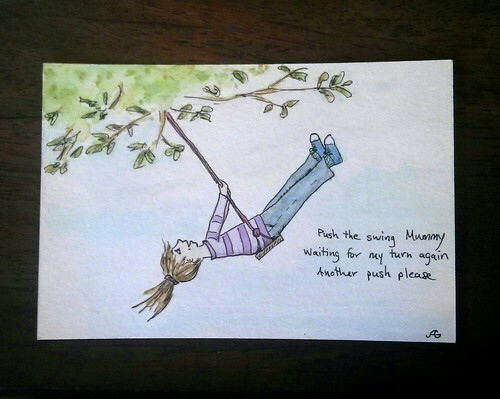 An illustrated Bill Watterson quote done in the Calvin & Hobbes style. How to eat a bacon sandwich. Awesome and subversive short documentary by a 4th grader. 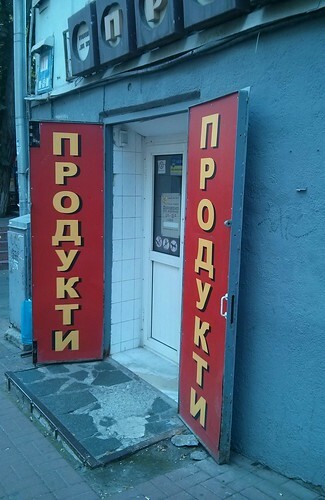 (via Cup of Jo). Beautiful photos of everyone's favourite city... Paris of course. How to get a 5 year old to sit still and concentrate for 4 hours. I love my new Springcourt sneakers, which are soooo much more comfy than my cute, but insole-less Bensimons. Also, John Lennon wore a pair on the cover of Abbey Road. I want to make some of these for our dining table. Images are being set free. 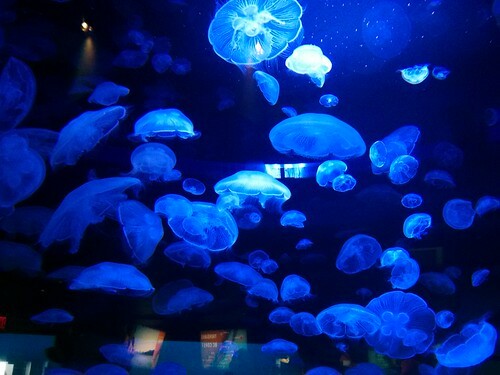 Go make something astounding! 100 Ideas. You know, in case you were at a loss for what to do this weekend. What Ira Glass has to say about Good Taste. Reassuring, isn't it? Amazing photo series of ballet dancers set in the real world. 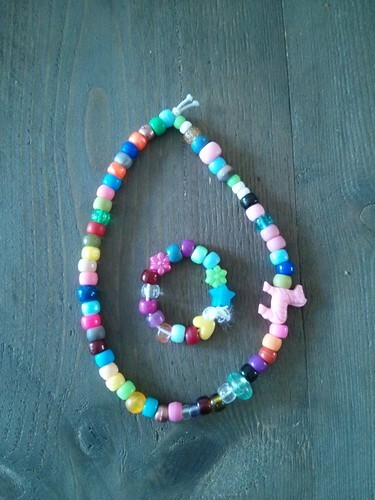 The Wee Lass and I recently spent a fascinating (to use her word) afternoon making some bead string jewellery. 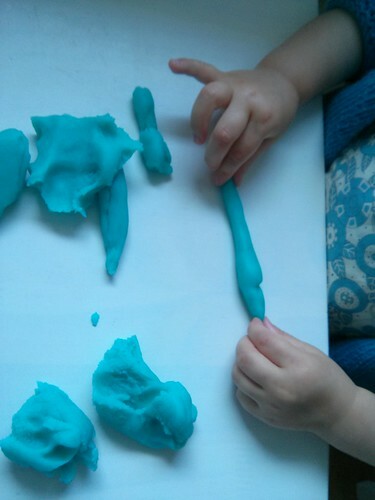 Our method is easy for a toddler to do nearly independently. 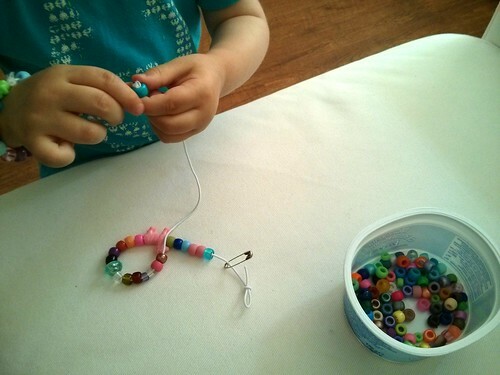 Given the small size of the beads, use your common sense if your child is ready to do an activity like this or not. 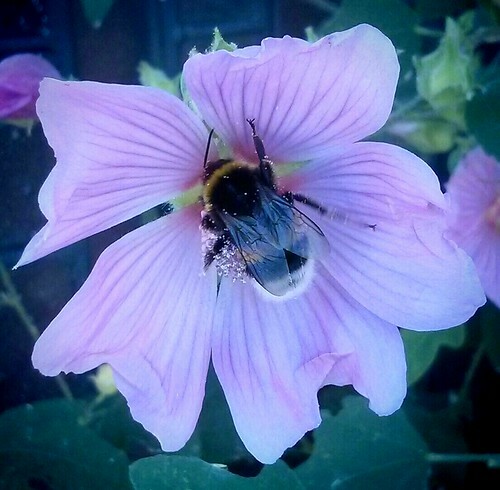 Share pictures of your creations in my flickr group. 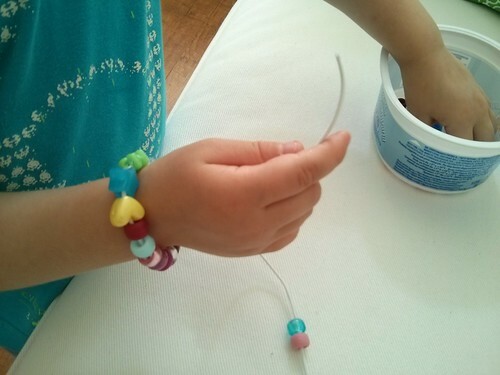 Of course you can make bead bracelets with just about any string-like material and anything with a hole in it (macaroni necklaces are a classic! 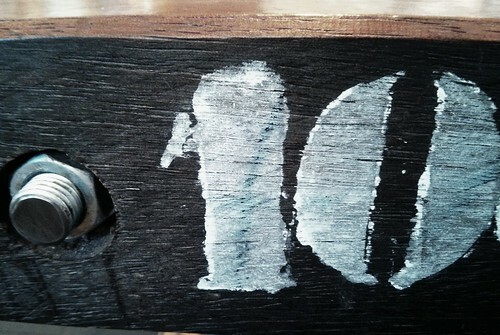 ), but these materials are easy and appealing to use. The cord elastic is stiffer than twine, yarn, or string, meaning it's easier to thread a bead onto and because it's stretchy, you won't need any fasteners. 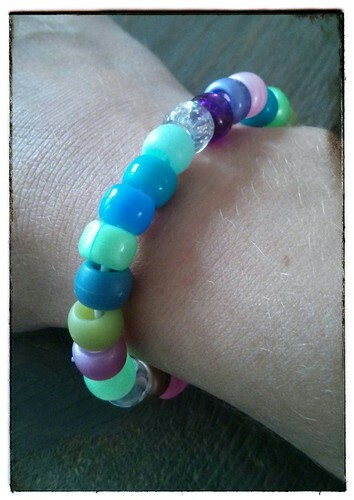 "Pony" beads come in a variety of fun colours, they are inexpensive, and they have large holes, making them easy for a toddler to thread onto the cord. Measure a length of the elastic that fits appropriately for a bracelet or necklace, then add a couple inches extra for tying it together at the end. It's better to have it a bit too long and trim the excess after you tie the knot than to struggle with tying it off. Tie a slip knot in one end, using up at least 1 inch. You want to "save" some of the elastic so you have some free to tie it up with at the end. I also put a safety pin through the elastic by the knot to ensure no beads can slip off. 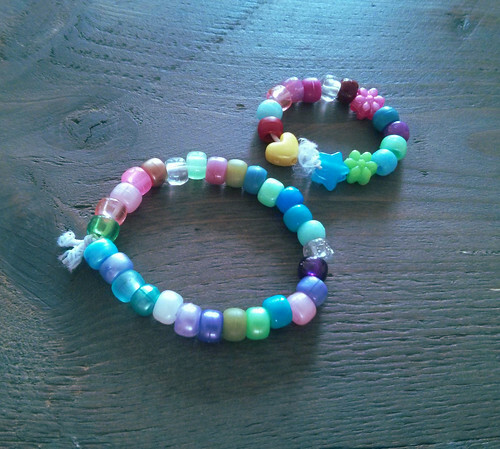 At this point, it's ready for your small person to start stringing beads. If they're doing a long string, you might add a safety pin part way through the beading process to ensure the beads already on won't slip off if they pick it up from the wrong end. I think losing some beads is inevitable. The Wee Lass was pretty zen about re-doing her work, but I can imagine some toddlers might have a meltdown if they dump off their whole string by accident. Just pin through the fabric elastic casing near the current top bead. Once they get to about an inch or two from the end, it's time to tie it off. 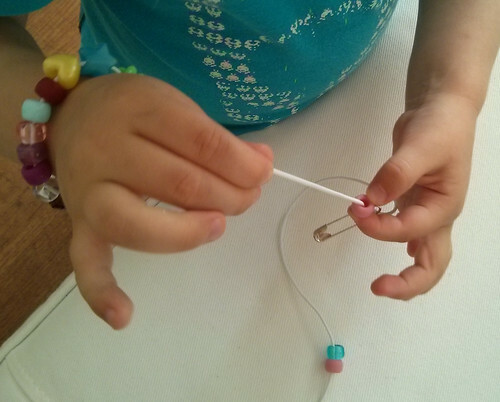 Undo the slip knot in the bottom of the string and remove any safety pins. 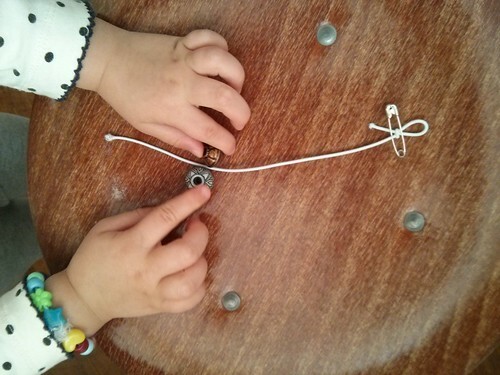 Holding the two ends together, stretch the elastic a bit and tie a knot as close as you can to the beads. Double check the size and then snip off the tails if they're too long. The new IKEA item that I'm coveting. How to make goldfish crackers. 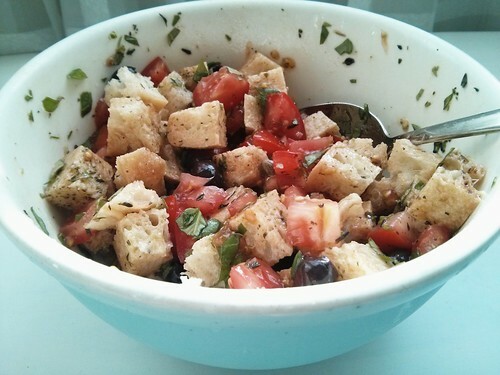 One of our favourite easy dinner dishes this summer has been panzanella. It's quick to make, refreshingly cool on a hot day, and it gets gobbled up by the Wee Lass. Saw the stale bread into small bite-size cubes and place in a shallow salad bowl or deep pie dish. I used the end of a loaf of rosemary foccaccia. If your bread is really stale, you'll want to make sure it all gets thoroughly soaked, so that's why a shallow dish works better. Now you're going to make a juicy concoction to dump on top. You could mix it in a separate bowl first, but I always just add it to the bread as I go. Finely chop your tomatoes (and cucumber if you're using it) into small cubes. If your bread is super stale, then add a can of diced tomatoes for extra liquid and tomatoe-y goodness (I didn't need it in this case). Drizzle on a generous amount of olive oil (use a bit more if your bread is really hard) and add the balsamic vinegar. Mix this sauce around to combine. You can add finely chopped garlic and shallot directly, but I prefer to soften the flavour of it with a quick saute. I actually forgot to add it in the pictured salad and the whole thing was still tasty. Add a bit more olive oil if it seems like a good idea. Toss in a big spoonful of capers and enough olives for everyone to get at least 3 or 4. 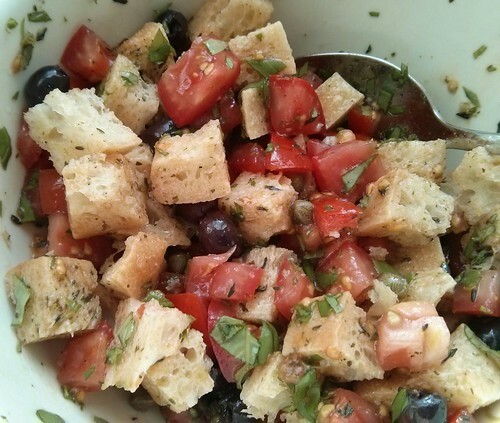 Finely chop a generous bunch of fresh basil, thyme, and oregano and add to your bowl. Sprinkle with sea salt and freshly ground black pepper. Mix it and let it sit for 5 minutes before serving. A must-make recipe for anyone with a toddler. We make 1/4 batch at a time. You don't have to be pretty. A cute tip for improving your french accent. My current favourite book to read to the Wee Lass. Quirky idea for taming cable clutter.